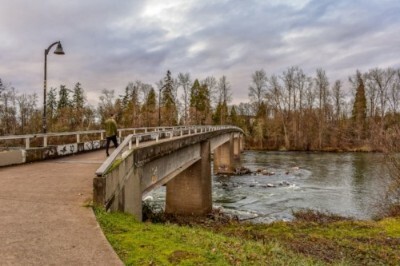 Found monthly in 2018 InMotion articles the "Bridge of the Month" feature tells the story of a dozen bridges that help move people using active transportation in Eugene. Here they are gathered for reference. The February Bridge of the Month is the Knickerbocker Bridge. Named after Willie Knickerbocker this bridge was constructed by EWEB in 1980. Like many bridges over the Willamette River, EWEB had a need to deliver utility services across the river. In this case, the city and county paid extra to have a bridge deck and railing added to the utility project. 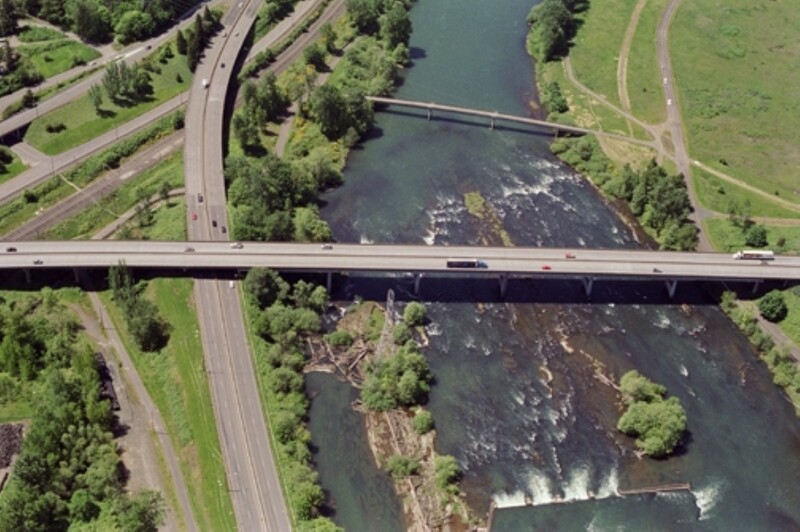 The Knickerbocker Bridge is located just west of I-5 and is most often used by people traveling between Springfield and the UO campus area in Eugene. Willie Knickerbocker, whom the bridge is named for, was considered by some to be “the father of bicycling in Eugene." Born in 1868, Willie was known for riding his fixed-gear bicycle great distances. Some folks claimed he rode to Mexico and back. Willie was a fixture in the community, always riding his bicycle, and often performing tricks for local children and riding in the Eugene Pet Parade in the 1950s. In December 2018 a new plaque, with Willie's picture, was installed to replace an older one that had been removed. In 1970 the dream of a pleasant way across the river was accomplished, with help from an unexpected benefactor. 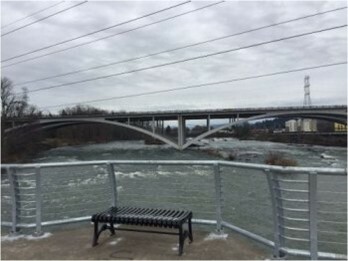 The City’s publicly-owned purveyor of water and power, Eugene Water and Electric Board (EWEB), was planning a conduit to carry steam across the river from a point near the University to a commercial greenhouse near Autzen Stadium. The river’s hard rock bed and shallow water precluded a buried pipe. EWEB took the unusual opportunity and proposed to make the conduit passable for bicycles and foot traffic if the University and the County assumed the extra cost. The three jurisdictions reached an agreement and the bridge was built. This bridge was designed by Oregon Bridge Engineering Company (OBEC) and spans 667 feet long and 14 feet wide, it cost $175,000 (including the steam line) and has six intermediate supports. The bridge, officially known as the "Dave and Lynn Frohnmayer Pedestrian and Bicycle Bridge" was originally called the Autzen Footbridge and is often simply referred to as such. It connects the campus area to Autzen Stadium but also serves as an important connection to the Ruth Bascom River Path network as well as to residences, Alton Baker Park, Cuthbert Amphitheater, Eugene Science Center, PK Park, Emerald Valley BMX track, and other locations on the North side of the river. This past month Nearby Nature's Opens a New Window. new volunteer TAG Team (Taskforce Against Graffiti) created a mural featuring local animals and plants– ducks, beavers, frogs, and more – on the bridge to help reduce illegal graffiti and create a more pleasant and beautiful crossing of the Willamette River. The mural stenciled images were created by Nearby Nature volunteer and Portland Talking Walls muralist, Corie Hinton. Contact them if you're interested joining the TAG Team. Come down to this months Breakfast at the Bike Bridges Opens a New Window. (September 28) event to check out the new style! 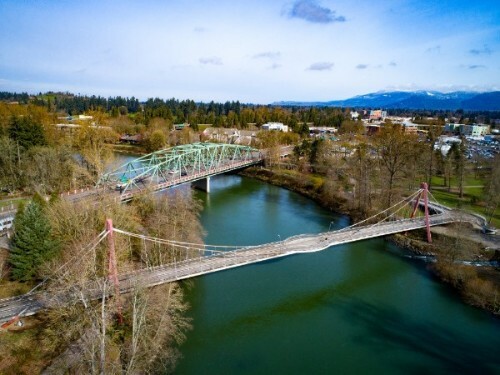 The DeFazio Pedestrian Bicycle Bridge provides a vital link between Alton Baker Park, Coburg Road and downtown Eugene, spanning the Willamette River and utilizing the Ruth Bascom Riverfront Bicycle Path. This bridge was designed to be a state-of-the-art structure in addition to being aesthetically pleasing. This suspension bridge incorporates unique technology that was utilized for the first time in the United States, including cable strands encased in galvanized carrier pipes and an extremely efficient deck constructed from precast concrete sections that were slid out across the river on temporary cables supported by the bridge’s main towers. Because of this innovative design the project received the ACI/OCAPA 2000 Excellence in Concrete Award; the American Council of Engineering Companies 2001 National Award of Merit; and the CECO 2001 Engineering Excellence Award and 2001 Grand Award. The bridge was named after Oregon Congressman Peter DeFazio and designed by Oregon Bridge Engineering Company (OBEC). Completed in 2000, it is 590 feet in length and cost $2.8 million. The Ferry Street Bridge spans the Willamette River and was built in its current form in 1950 (for $448,000). It is located near downtown Eugene, where the city's founder Eugene Skinner once operated a ferry service until a covered bridge was constructed in 1876, in the vicinity of the current bridge. The bridge is at Willamette river mile 182.2, and is a block west of the north terminus of the actual Ferry Street. The neighborhood immediately north of the Willamette River near the bridge is often called the "Ferry Street Bridge area." The bridge carries an average of 73,000 motor vehicles a day and has a shared-use path that connects to the Ruth Bascom River Path on both sides of the bridge span. The bridge is approximately 800 feet (240 m) long, though the river width is only 300 feet (91 m) here, Club Road passes under the Ferry Street Bridge on the north shore along with a bike path; another bike path passes under the bridge on the south shore where it enters the east end of Campbell Park. The Peter DeFazio Bridge (featured in the May InMotion) is located approximately 800 feet (240 m) upstream. When the bridge was constructed in 1950 that work displaced a “tent village” of mostly African American families that had settled under the bridge as housing was expensive and difficult to find since deed transfer restrictions limited non-white people from purchasing property and most white residents of Eugene were unwilling to rent to black families. Sam Reynolds and his family were given permission to live at a home on County property under the bridge and a small community was built with others building structures on the land as well. 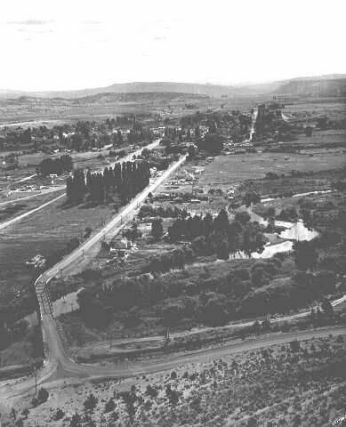 By 1948 the tent village, “consisting mostly of wood frame structures with canvas roofs”, grew to eleven tents, three houses and over fifty people. The displaced families settled in different areas around Eugene including out West 11th near Bailey Hill and in the Glenwood area, both areas had issues around access to water or flooding. Some families were relocated across the river to the east of the bridge near High Street, including CB and Annie Mims whose home is now on the National Register of Historic Places and has a monument dedicated to the family. An update of the bridge was completed in 2001 as part of a $30 million, 1.5 mile transportation corridor upgrade and enhancement project. In 1994 the city considered replacing the bridge with an “expanded, modern structure” with six vehicular travel lanes, however voters rejected the proposal and funding for upgrades of the approaches were proposed instead. The 2001 project included roadway alignments, new LTD transit stops, and pedestrian and multi-modal enhancements and incorporated urban amenities, landscape, specialty paving areas, and improved lighting. The two underpasses of the shared-use path at Martin Luther King Blvd. and the I-105 on-ramp were part of this improvement project as well as the extension of the path to Coburg Road. The DeFazio Bridge was installed as a separate project during this same time. The bridge still requires maintenance updates and seismic retrofitting. 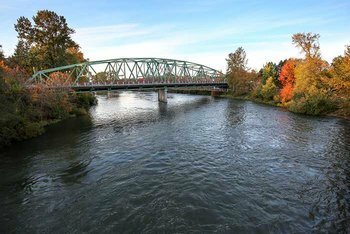 The City plans to work with a bridge consultant to prepare detailed plans for those repairs, including bridge cleaning, paint repairs and bridge deck rehabilitation. This repair work is scheduled for 2022. The consultant’s work will also include testing and analysis to identify methods to strengthen the bridge in response to potential earthquakes. 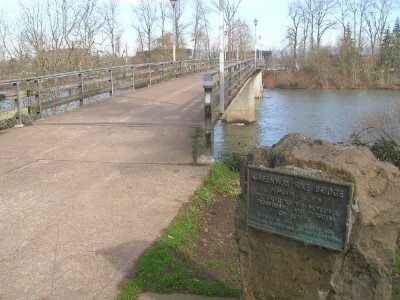 The Owosso Bike Bridge was the fourth of the five pedestrian and bicycle bridges to be built across the Willamette River in Eugene. The 490-foot bridge opened to the public in 1985. The bridge is an important transportation crossing for people walking and biking to get from the East Bank and West Bank sections of the Ruth Bascom Riverbank Path system. It is located near Owosso Drive on the west side of the Willamette River and just north of Marist High School on the east side. Like the Knickerbocker, Frohnmayer, and Greenway bike bridges, the Owosso Bridge was a multi-agency funded project to provide a transportation facility on top of the bridge with utility company pipes underneath. Four agencies shared the cost based on the ratio of the cost each party would have incurred for separate facilities; the Metropolitan Wastewater Management Commission (42%), Pacific Northwest Bell Telephone Company (6.5%), City of Eugene/Lane County (48.5%), and the Eugene Water and Electric Board (3%). Hannan Bros. Construction, Inc. was the low bidder at $854,637. As part of a major Oregon Department of Transportation (ODOT) interchange improvement project for Beltline and I-5 a new pedestrian and bicycle bridge was required to be built as part of the project. A design team collaborated to develop an iconic cable-stayed bridge located immediately south of the improved highway interchange. The cable-stayed bridge type helped the designers deliver a “sleek structure that was both rapidly constructible and extremely economical.” OBEC Consulting Engineers and Jiri Strasky had worked on three other signature shared cable-supported bridge types in the area: the DeFazio Bridge, the Delta Ponds Bridge, and a gravel conveyor bridge crossing the McKenzie River near Coburg. 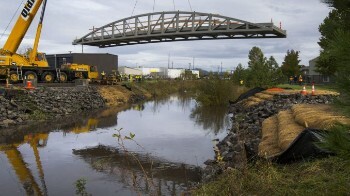 Creating the highly visible bridge in 2009 created a “gateway” to the community showing the importance of active transportation to those entering Eugene and Springfield via I-5. 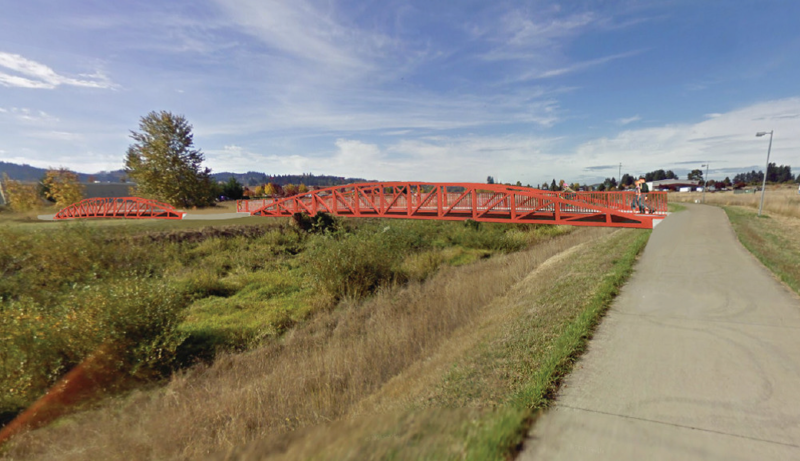 The bridge also provides an important connection between Eugene and Springfield and a new shared-use path system that now runs from Old Coburg Road down to Garden Way near I-105. Mechanically stabilized earth (MSE) walls. 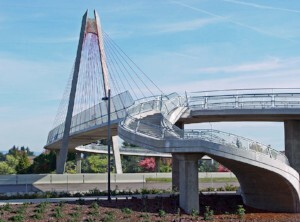 Award: 2010 Portland Cement Association Concrete Bridge Award for excellence in design and construction. This month’s bridge is the Blue Heron Bridge which crosses Amazon Creek between the Fern Ridge Path and Westmoreland Park. It was installed in 1985 and dedicated on October 10. The new bicycle bridge was officially named the Blue Heron Bridge by the City of Eugene’s Joint Parks Committee. The committee’s decision incorporated the names proposed by both the first and second place finishers (Eli Volem and Chia O'Keefe) in a name-the-bridge contest at the then named Ida Patterson Elementary School which is now César E. Chávez Elementary School. The bridge is a key link between Arts and Technology Academy, Boys & Girls Club, Westmoreland Park, the path system through the park, and the Fern Ridge Path allowing people walking and biking to avoid busy streets. If you're lucky you might actually see a Blue Heron in Amazon Creek as you cross this small but important bridge. This month's bridge is the Buck Street Bridge. It was installed in October 2016 as part of the West EmX project that brought Bus Rapid Transit (BRT) to West Eugene. The bridge connects the neighborhood on the south side of Amazon Creek with the businesses and West EmX stations along the West 11th corridor on the north side of the creek. This 90-foot bridge was one of four installed as part of the BRT project, another was at Wallis Street and the other two were part of the Commerce Connector near the commercial district at the far end of the West EmX line. All four 14-foot wide bridges were built by a company in Minnesota and each was brought to Eugene by truck in two pieces. When put together the bridges weighed more than 42,000 pounds, or about 21 tons. Cost for the three bridges was approximately $2.9 million. The bridge was installed by Eugene-based Oldham Crane Service through a contract with the EmX project contractor, Wildish Construction. You can see a video of the bridge being installed at in this Register Guard story. The Buck Street Bridge is in our SmartTrips West Opens a New Window. neighborhood and you can experience it on our September Sunday Streets event! The Bridge of the Month is the Richardson Bridge, which is located on the Fern Ridge Path and provides safe crossing over the Amazon Creek near Quaker Street in West Eugene. It was built by the Coast Bridge Company in Portland, OR in 1912. This bridge was originally placed over the Crooked River in Crooks County, OR in 1912 (top). 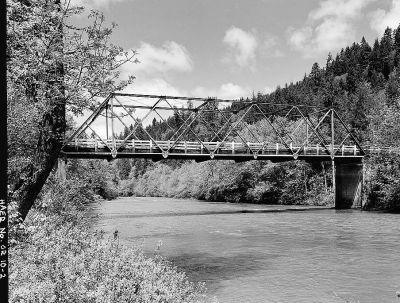 In 1956 it had its first excursion into Lane County and was placed over the Siuslaw River on Richardson Road (middle). 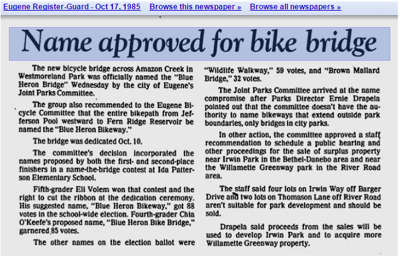 It wasn’t until 1986 that the bridge found its home in Eugene and was placed in its current location (bottom). 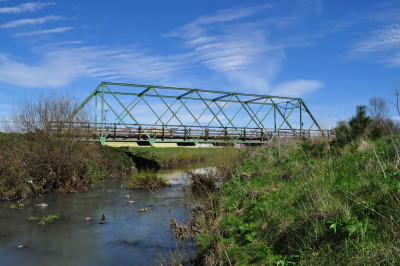 This is a Double Intersection Warren Through Truss bridge that spans 124 feet and is 18 feet wide.With its rich history it is eligible for the National Register of Historic Places, though is not currently listed. Funded through a Connect Oregon grant and completed November 2017, the Commerce Connector Path and Bridges are two of the newest pedestrian and bicycle bridges in Eugene. The City of Eugene and Lane Transit District partnered to deliver three essential bridges, Buck Street, Wallis Street and Commerce Street, in order to connect the Fern Ridge Path to West 11th Ave as part of the West EmX project. The Commerce Connector is approximately 1,000 feet west of Bertelsen Road. This section has 300 feet of new 12-foot wide concrete path, a 75-foot bridge over wetlands and a 135-foot bridge over Amazon Creek. Additionally 250 feet of the Fern Ridge Path was moved and raised so the new bridge did not interfere with the 100-year flood plain. The path juncture at Commerce Street reduced the street width to improve pedestrian crossing convenience and safety.